In 'Last Cab To Darwin', Jeremy Sims ('Beneath Hill 60') directs Australian acting legends, Michael Caton and Jacki Weaver against the backdrop of the stunning Australian outback and alongside the outstanding Mark Coles Smith, Ningali Lawford-Wolf and Emma Hamilton. Caton gives the performance of a lifetime as Rex, a Broken Hill cab driver who, when told he doesn’t have long to live, sets out on an epic journey to Darwin in a bid to die on his own terms. Along the way he discovers that before you can end your life you have to live it, and to live it you have to share it. Filled with hope, humour and heart, 'Last Cab To Darwin' takes us on a journey in cinemas from August 6, reminding us that it’s never too late to start living. The 'Last Cab To Darwin' competition has now closed. Winners will be announced shortly. Competition opens at 9pm AEST on Friday 31st July 2015 and closes at 11:59pm AEST on Thursday 6th August 2015. Five winners will be chosen at random on Friday 7th August 2015. To successfully win, entrants must fulfil the above entry conditions before the time the competition closes. Current members/followers are eligible to enter the competition. Only one entry per person. Only one winner per household. To be a valid winner, the entrant must not have won a prize from SWITCH within the last 28 days. Each winner will receive one double pass to 'Last Cab To Darwin'. By entering, you agree to receive occasional emails from SWITCH in the future. If you decide to unsubscribe from these updates, any further entries will not be applicable. Only Australian residents are eligible to enter. 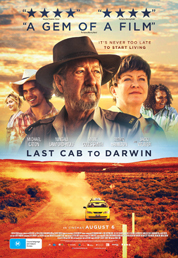 'Last Cab To Darwin' is in cinemas from Thursday the 6th August 2015 through Icon.